Accidents are unavoidable - but if it’s predictable, it’s preventable. The wealth of fire data sitting in your RMS is likely going underutilized. Mixed with mySidewalk’s unique visualization tools and access to over 2,000 national datasets, the mySidewalk Community Risk Assessment (CRA) gives you unprecedented control over decreasing fire, EMS, and other incidents. Already heralded for its innovation, this dashboard becomes a powerful tool in the right hands for creating department priorities, launching new reduction programs, and building bridges within your community. Understand your districts better than anyone with our full community profile that assesses population, housing, income, health, and more. Get a hold of your incident and response trends with 5-years of data analysis. 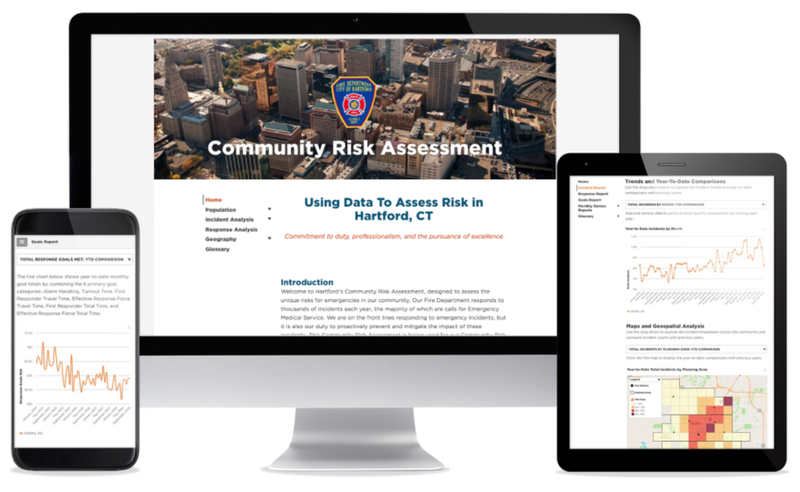 Correlate your data with our community data to see where the overlap of poverty, low education, health disparities, and more aligns with fire and EMS calls. Assess the distribution of risk in your city with our built-in maps and geospatial analysis sections. Set priorities and objectives with the deepest assessment of your fire incident data that you’ve ever received. Let's talk about a CRA Dashboard for your department. We'll discuss your goals, your ideal dashboard, and pricing. The best part? When you're ready to move forward, mySidewalk can build and deliver your interactive dashboard in 60 days or less.